Aero Fighters (known as Sonic Wings in Japan) is a vertical-scrolling shooter arcade game that was released in 1992 by Video System. In 1993 it was ported to the Super Famicom and to the SNES in 1994. It spawned a series consisting of two sequels for the Neo-Geo, one for the arcades (with ports to the PlayStation and Sega Saturn) and one in 3-D for the Nintendo 64. The first sequel was notorious for multiple instances of Engrish, such as "I never thought I'd be frying over a jungle." 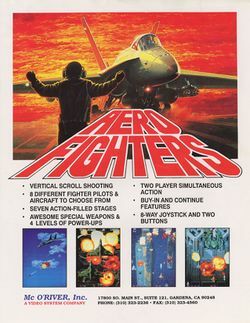 Most of the creative team that worked on Aero Fighters created Strikers 1945 and other shooters for Psikyo. Players can choose from one of 8 different characters; each with their own storyline. This page was last edited on 26 January 2018, at 00:53.